-TRENDnet, a best-in-class wired and wireless networking hardware brand, demonstrates today from IFA Berlin, a full line of 450Mbps Wireless solutions. Other brands may currently offer 450Mbps wireless routers, however users need a 450Mbps client adapter in order to realize the promised 450Mbps throughput speeds. Most computers with integrated wireless are rated at 150Mbps. When connecting to a 450Mbps router, the respective computer's connection speed will be bottlenecked at a slow 150Mbps. TRENDnet is currently the only brand to offer a selection of 450Mbps routers and adapters needed to build a fully integrated high performance 450Mbps network. 450Mbps Concurrent Dual Band Wireless N Router is the first router to support 450Mbps speeds on both the 2.4GHz and 5GHz bands at the same time. This router's raw horsepower redefines wireless networking as we know it, to easily stream HD video through the home. Gigabit Wide Area Network and Local Area Network ports transfer wired data fast. Embedded GREENnet technology reduces port-based power consumption by up to 70%. The TEW-692GR comes with a 3-year limited warranty and is currently available from online and retail partners. This was the very first 450Mbps router launched to market-a full four months ahead of competing offerings. This router's raw horsepower seamlessly streams HD movies to your entertainment center, transfers content from countless users, and generates record wireless coverage. Gigabit Wide Area Network and Local Area Network ports transfer wired data fast. Embedded GREENnet technology reduces power consumption by up to 70%. 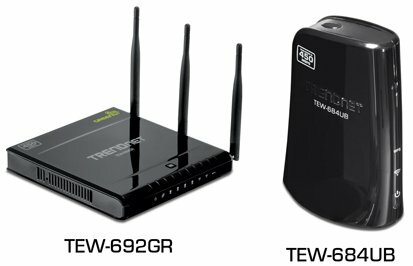 The TEW-691GR comes with a 3-year limited warranty and is currently available from online and retail partners. This is the first adapter which upgrades laptop or desktop connectivity to never before seen 450Mbps wireless speeds. Computers purchased with integrated wireless are most often outfitted with either 150Mbps Wireless N or even slower 54Mbps Wireless G technology-which bottlenecks performance to 150Mbps or 54Mbps respectively. TRENDnet's TEW-684UB is the first wireless USB adapter that has the capability of connecting to a router at 450Mbps speeds. The TEW-684UB comes with a 3-year limited warranty and is currently available from online and retail partners. TRENDnet's first to market 450Mbps Wireless N Gaming Adapter, model TEW-687GA, networks gaming consoles, televisions, and NVRs to the Internet with an ultra-high performance 450Mbps wireless connection. Setup is quick and simple, with no drivers to install and a Gigabit Ethernet port transfers wired data fast. The TEW-687GA comes with a 3-year limited warranty and is currently available from online and retail partners.